To register for Moonlight & Roses online, please use Firefox or Chrome as your browser. Or please call Kristen Casalenuovo at 215-247-5777 x418 to register over the phone. What could be better than a magical night of dining and dancing under the stars, surrounded by the lush beauty of roses in bloom? Moonlight & Roses is the Morris Arboretum’s annual fundraising gala to support all aspects of the Arboretum’s mission. The evening begins with cocktails in our stunning Rose Garden at the peak of its bloom. Dinner follows underneath of a clear-top tent with a live band, dancing, and open bar. Purchase your tickets today. Guests joining us as Benefactors or Patrons will be invited to attend a VIP reception in the Rose Garden from 5:30 – 6 p.m. on the night of the event. In addition, there will be the provision of premium parking at the top of the hill that evening. View photos from last year’s event. If you wish to receive a copy of the invitation or have questions about the event, please contact Kristen Casalenuovo at 215-247-5777 x418 or kcasal@upenn.edu. To see photos from last year’s gala, click here. This year we are delighted to honor Mary and Richard Graham at the 2019 Moonlight & Roses gala. Although Mary and Richard grew up in the Philadelphia area, they originally became acquainted with the Morris Arboretum in 1989 when, as residents of St. Louis, they would come back to Philadelphia to visit family. In 1999, the Grahams moved back to the Main Line and began to enjoy the Arboretum on a more regular basis. In 2005 Mary and Richard became founding members of the Arboretum’s Directors’ Guild. Mary inaugurated a yearly day trip for Directors’ Guild and Advisory Board members to experience other beautiful gardens across the region. Mary and Richard are also longtime members of the Collector’s Circle, and are members of the Lydia Morris Legacy Society. In 2015, they established the Mary P. and Richard W. Graham Endowment Fund, in honor of their children – Susan, Carol, Elizabeth, and Richard – which supports conservation and care of the natural areas at the Arboretum, particularly along Paper Mill Run. Mary and Richard are true life-long champions of the Morris Arboretum, and we are deeply honored to have this opportunity to pay special tribute to them at this year’s gala. The Morris Arboretum is pleased to pay tribute to its first-ever corporate honoree at this year’s gala. Criteria for selection of corporate honoree include a demonstrated commitment to conserving the natural environment through philanthropy, education, preservation, and/or sustainability in business practices. There is no one better suited for this inaugural role than The Haverford Trust Company. As an independent, privately-owned wealth management firm founded in 1979, Haverford Trust has deep roots in our community. They have spent forty years building relationships with nonprofit organizations that transcend investment management. Nearly three decades ago, Haverford partnered with the Arboretum in support of Moonlight & Roses, ultimately rising to the level of Presenting Sponsor. George Connell, founder of The Haverford Trust Company, was instrumental in creating this longtime partnership. Co-chairing the 2019 Moonlight & Roses Planning Committee are Sarah Salmon and Sally Gendler. Sarah grew up next to the Arboretum, and considered it her own back yard, roaming free from a young age. Sarah served on the Moonlight & Roses planning committee from 2006 – 2010 before moving to London. She returned in 2016 to Chestnut Hill with her husband and three kids, Isabel, Field, and William. Sarah loves being able to share her favorite hideouts with her family and take advantage of the programming for children and adults. Sally Gendler, originally from New Haven Connecticut, relocated to Philadelphia after marrying her husband, Steven. After living for more than 15 years near Springside School so that daughters Abigail and Liza could be close to school, they recently moved to Meadowbrook Avenue. Sally is taking advantage of her proximity to the Arboretum – as an education guide, horticulture volunteer, and archive volunteer. She is also an active Penn State Extension Master Gardener, volunteering at The Mt. Airy Playground, teaching gardening, and cooking with the local families. Moonlight & Roses is the Morris Arboretum’s annual fundraising gala that raises money for the arboretum’s annual operations. Funds raised through this year’s event will support all aspects of Morris Arboretum and will ensure continued excellence in direct support of our mission. Morris Arboretum would be happy to provide you with more information on the Corporate sponsorship benefits of Moonlight & Roses and the many effective ways to tap into the loyalty and buying power of the over 3,000 households who receive the invitation each year, the 10,000 constituents who subscribe to the Morris Arboretum e-newsletter and the over 880,000 people that visit our website each year. To become a corporate sponsor, please contact Kristen Casalenuovo at 215.247.5777 x418 or kcasal@upenn.edu. As a longstanding Arboretum tradition, the Moonlight & Roses gala, which always takes place in early June, is unsurpassed. 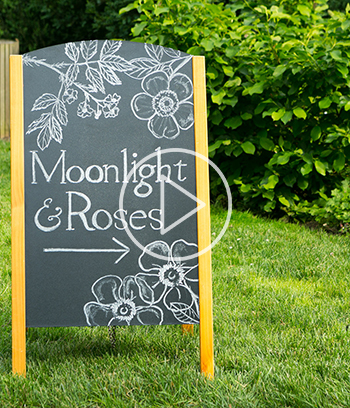 The lively garden party we now know as Moonlight & Roses has had a colorful evolution. In the early 1970s, it was dubbed the Spring Fling, and was held on the lawn behind Gates Hall. The late Jane O’Neill was instrumental in the success of the gala in those early days. In the 1980s, patrons and contributors donned their garden party attire for the event that was rechristened Moonlight & Roses . The evening traditionally begins with cocktails served in the Rose Garden, while dinner, served by a professional catering staff, is held in a festive tent atop the hill near the Widener Visitor Center. Music and dancing round out the evening of friendly conversation and gourmet dining. Moonlight & Roses has always provided an intimate setting unique to Philadelphia charity events, and is enjoyed by a capacity crowd each year. The Morris Arboretum's annual fundraising gala, Moonlight & Roses , has become a tradition among friends, families, and colleagues in the Delaware Valley.